I've just completed this example of one of Elmer's less common engine builds, and I realised that it's the first engine that I've built that does anything more than turn the flywheel! The build is straightforward, and the performance perfect for providing feed water to the steam plant's 3" diameter boiler. The pump suffers from water hammer in operation, which makes the engine and steam plant sound a little noisy at times, but I understand that this is also a feature of the full size unit. 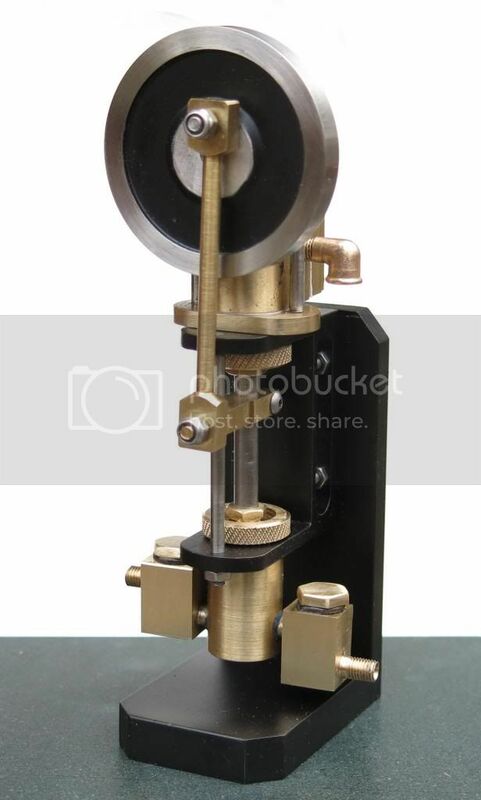 As an aside, I find that Sandy Campbell's 3" vertical boiler design will drive both Elmer's VR75 engine and the steam pump (mostly on bypass) on a continuous (or at least for 1 hour) basis, and this with a 1" diameter ceramic gas burner rather than 2" diameter as designed. I'm thinking of Elmer's Radial #11 Engine next - with round cylinders as per common recent practice. Note to author - must try to improve diamond knurling! The volume of the pressure bell should be 4-5 times the swept volume of the pump.....put a valve at the top to periocically LET AIR IN to replenish the air that gets entrained in the delivery. Cograts Geoff on a lovely pump. Nice one Geoff, and a great video as usual!! So you are feeding water into the boiler while under pressure? What pressure is the boiler running at ...I would assume 40 psi or less based on the pump output pressure. Yes, the pump feeds the boiler under pressure - don't forget the pump itself uses the boiler. The boiler safety valve blows at 45 psi and the pump will certainly pump water past the clack valve at anything upto this pressure. The video figure of 40psi output pressure with an input of 12 psi is only an example - I haven't explored the upper limits given that the plant will trundle along nicely on as little as 5 psi. My thanks go to inkey engines for showing this video and inspiring me to start a new project after a gap of over a year, My last build was Lady Stephanie which i found a bit daunting and i did'nt finish. This pumper looked a lot of fun so i raided the scrap box and found enough to make it. I must say it has some quite small parts such as the valve and eccentric so it is still a challenge. I got it running yesterday and was very pleased with the result and it pumps 100ml of water per minute. When i ran it on steam it was much more fun with oil and water flying around. you forget how hot everything is going to get. You'll be able to use that for coolant. Nice engine, good scrap box. Very nice Geoff, nice to see it running on steam too. Great build, Jeff. Works wonderfully! It looks strangely like 1/2 of Elmer's Pumping Engine that I'm building now. I've not run anything under steam yet, but, a PM Research horizontal boiler kit is on the bench awaiting the completion of the pumping engine. I'm delighted you were inspired to get back on the tools and build this little pump - well done. Mine is still both driven by, and pumping feed water to Sandy Campbell's 3" boiler. I think your pumping engine should deliver about 7 times the volume of this small single cylinder pump. From my recollection of the last time I ran the pump - I think it is water hammer because it seems to manifest itself as vibration within the hydraulic system rather than valve slam noise. I do get oscillation in the boiler clack and this is noise with an obvious source. Nonetheless, I will check the ball lift. I worked (as far as possible) to Elmer's dimensions and I think this yields a lift of the amount you suggest.